This is what starts to pump out of your TV once you boot up Teenage Mutant Ninja Turtles: Out of the Shadows, and if you’re a child of the 80’s/90’s like I am, you get a warm feeling of nostalgia and immediately think you’re in for something special. You would be wrong. 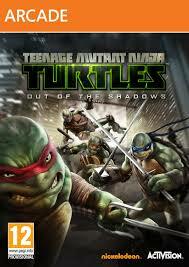 Out of the Shadows is not only one of the, if not the worst game, to star the Turtles, it’s just not a very good game period, which is frustrating. There are elements of this game that are so clearly ripped straight from much better games from a team that fails to understand on even on the most basic level what makes those mechanics fun. If you haven’t figured it out, I didn’t really like this game all that much. Out of the Shadows isn’t a tie-in to the film that’s out today, but is instead the first game from the Activision/Nickelodeon partnership that started three years ago. Developed by Red Fly Studios, it’s a bit difficult to really describe what Out of the Shadows is. 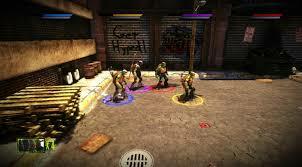 It has a dark, realistic art style more reminiscent of the early TMNT comics and the first live-action feature film, yet also takes a lot of inspiration from the new animated series that started in 2012 with the way characters like Baxter Stockman look and the way the Krang robots look and act. None of the talented cast from the show, like Sean Astin, Greg Cipes, or Rob Paulsen are nowhere to be found; Something they should probably be grateful for. I appreciate that Red Fly tried to do something different with their take on the iconic Heroes-in-a-Half-Shell, yet the characters look a little too realistic and it makes them look ugly and weird. The environments don’t fare that much better, as this game is a unfortunate example of graphics that can be described as “Unreal-y”. Out of the Shadows runs on the Unreal 3 engine that powered a lot of games on both the PS3 and Xbox 360, yet it does so without the years of refinements that developers had made with the technology since its inception. Levels, composed of generic sewers, alleyways, subways and labs, that are so linear that they’re at times confusing to navigate, have that glossy, shiny look that does them no favours. Between stage cut-scenes are told via still pictures with little animation that, and I hate to use this comparison, look like they were made in MS Paint. Accompanying these cut-scenes and within stages is some pretty okay, to ear-ripping terrible voice acting as you have to stomach Mikey droning on for minutes at a time about pizza toppings, or characters having conversations with other ones once they’ve fallen in battle. These are the least of the games problems. When it was first announced, I was cautiously optimistic about Out of the Shadows because of the pedigree of the developer. Red Fly developed the Wii version of Ghostbusters that was actually really fun, as well as the Wii and eventual 3DS of Thor: God of Thunder that was much more enjoyable than the abysmal game of the same name for PS3/Xbox 360. 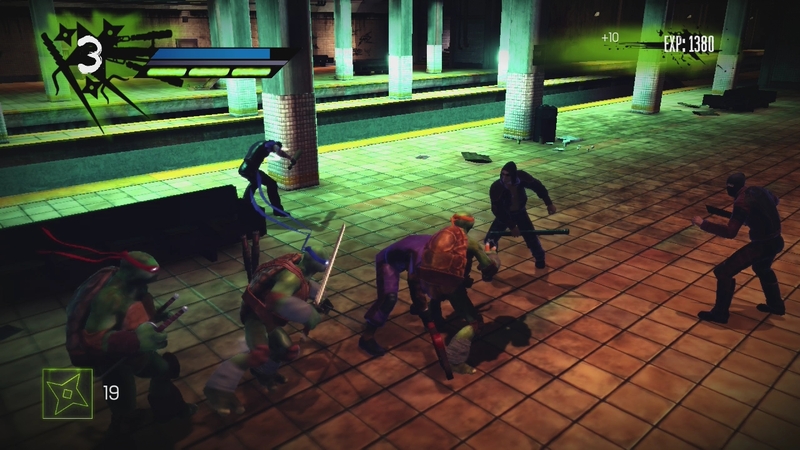 The early trailers for the game also pegged this as a game that was trying to emulate the combat style of Rocksteady’s Arkham games, so I was hopeful that a developer who had previously done right by two licensed properties and taking a page from one of the best combat systems going around could make for a at the very least, pretty good game. What you can gather from Out of the Shadows is that copying the rhythmic, attack and counter combat made famous by Rocksteady is a lot harder than it looks. This game is trying to be more than just a beat-em-up, but at its core that’s exactly what it is, and not a very good one at that. Levels sometimes force you to leap over small gaps, climb ladders, or slide under pipes, ninety-percent of the time you’re engaged in some of the most uninteresting and broken combat that I’ve seen in a video game in quite some time. On the surface, it looks like this game has a lot to offer. You can actively switch between all four Turtles who are always on-screen, there are combos to learn, counters to master, weapons to collect and switch between on-the-fly, even a levelling system with several pages of skill trees to develop. All this is pretty superfluous when even the basic attacks aren’t fun to pull off, nor do they connect properly most of the time or provide feedback on when you’re doing damage. The user-interface is also atrocious as this game provides a counter warning like in all the Arkham games, yet even though you know you hit the button at the correct time to counter, your character rarely does so and on top of that, it’s very hard to see the cue amongst all the chaos on-screen. This bodes even worse for special moves that require you to hold a trigger and make half-to-full circle motions on the controller that you only pull off when certain celestial bodies align. What also makes the combat even more insufferable is that Red Fly seemingly had no idea how to place the camera correctly for this style of game. The camera is positioned far too close to your characters instead of being zoomed out so it’s very easy for enemies to get a jump on you off camera, and this gets even worse when you’re in an enclosed space or forced against a wall. Then you also have to take into account the numerous bugs that occur during the campaign. I dodged roll out-of-the-way of the Cerberus Mouser boss into a room that I couldn’t escape, forcing me to restart from a previous checkpoint, and I lost track of the final boss in a pretty small arena until I found him under a ramp, standing still and staring at a wall. When not playing with friends, the other three characters you’re not playing as are controlled by the AI and they might as well not be present at all. Your brothers fall nearly all the time at the start of a fight, leaving you to deal with a room of enemies all on your lonesome. The only way to resurrect them is to use your limited supply of consumable pizza, which is simply a waste. The only break you get from fighting bad guys comes in the form of a hacking game where you have to trace a line to two same coloured icons without having any of the lines cross. This isn’t terribly fun or engaging the first time you do it, nor is it after you do it for what feels like the one hundredth time. Should you actually make it through to the end of this game, which I did and don’t suggest anyone doing, you’ll find it to be pretty short which is to be expected somewhat as it’s only a fifteen dollar downloadable game. Post-game content comes in the form of challenge maps, which would be a welcome addition if the combat was competent, and an arcade game that also uses the same fighting system only positioning the game more like the Konami beat-em-ups of the 90’s. Given that the game is pretty short and the environments really account to nothing only minor traversal between fights, this perhaps should have been what the main game was. 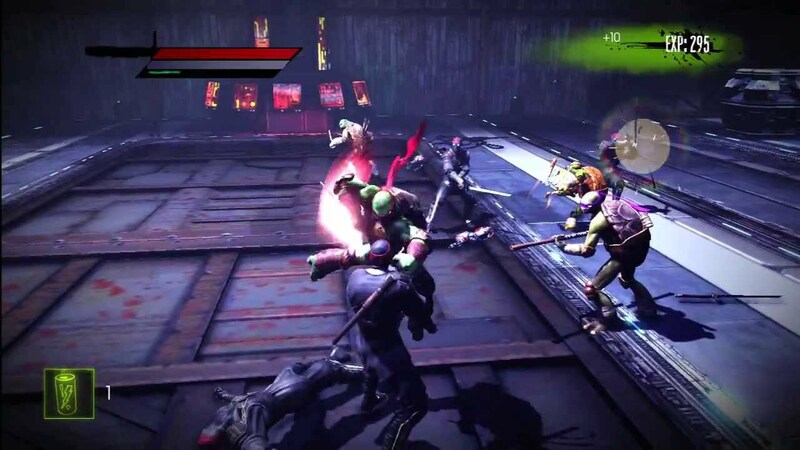 At the very least they could have tricked some more people into buying this with a fake promise that it was trying to modernize the TMNT beat-em-up. That being said, Ubisoft tried that with Turtles in Time Re-Shelled and that didn’t work out too great. WELCOME TO COMIC GAMERS ASSEMBLE, THE LOCATION FOR ALL COMIC-THEMED VIDEO GAMES!